Coconut ice cream is rich in medium chain fatty acids and lauric acid. “It helps support immune function,” says Gabrielle Francis, D.C. She’s a naturopathic doctor who has been on tour with music elites like Bruce Springsteen and The Rolling Stones and helps keep rock stars feeling their best. Ice cream is more than a treat—she tells us it's one of her favorite immune-boosting snacks. Lauric acid is a natural antimicrobial, and researchers have found that medium chain fatty acids may strengthen your immune system. Yet another reason to do yoga. In a study published in the Journal of Alternative and Complementary Medicine, researchers found that people who do yoga regularly have a stronger immune system and higher levels of antioxidants in their body. You don’t even have to go full hippie. In the study, doing yoga at home using a workout DVD counted. Browse the “Chill” mood section on Spotify or throw a soothing vinyl onto your record player. No, you haven’t accidentally clicked over to the Music section. However, there is some evidence music might actually do more than ease the pain of congestion. In the world’s first large-scale meta analysis of 400 different studies, researchers at a major Canadian university found that listening to music strengthens your immune system and even increases the amount of “killer cells” (the cells that defend your body from invading germs) in your body. Getting a healthy dose of humor is recommended for your general well-being. “[The] effects of humor on various outcomes such as stress, health and immune function have been well-documented by empirical research and are therefore commonly accepted,” reports scientists in the Evidence-Based Complementary and Alternative Medicine medical journal. We’ve all heard the old advice to take vitamin C for a cold, but more people should be talking about magnesium. “The depletion of magnesium from our soils due to modern farming methods and food processing has made it difficult to get enough magnesium from diet alone,” says Carolyn Dean, M.D. According to the National Institutes of Health, many Americans don’t get enough magnesium from their food. “Organic apple cider vinegar’s antibacterial and antiviral properties kill the microbes that cause sore throats,” says registered nurse Rebecca Lee. She notes that apple cider vinegar also contains inulin, a prebiotic that can enhance gut health, which may in turn help with white blood cell production. If you’re trying to dodge a cold, or you’re recovering from the sniffles right now, Lee suggests mixing two teaspoons of apple cider vinegar in a cup of pure filtered warm water. It might feel impossible to breath in right now, but just try, it’s worth it. According to the University of Maryland Medical Center, the scents from various essential oils can enhance your immune system. “I really like using rosemary essential oil when I have a cold,” says aromatherapist and herbalist Demetria Clark. “This oil opens the nasal passages and the lungs, [and it] has an antiseptic, antibacterial and antimicrobial action that is beneficial when dealing with colds and congestion.” She says sniffing rosemary essential oil may also help to loosen up stuffiness and ease sinus pain. It’s not just your imagination if you think a summer cold is worse than a traditional winter cold. It’s caused by a different type of virus and can make you feel all the normal stuffiness you associate with a regular cold, plus awful add-ons like muscle aches and nausea. 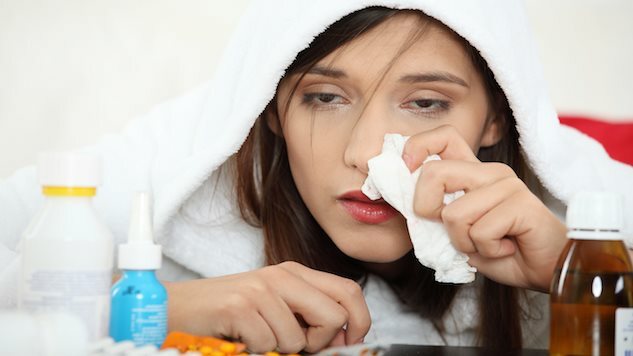 Texas A&M University reports that there are an estimated 10 to 15 million colds every summer, but you don’t have to be a part of those statistics. Armed with the following immune-boosting strategies, you can lower your risks and guard against the summertime sniffles. Oh, and don’t worry—these unusual health secrets work for winter colds, too. Joshua Duvauchelle is a fitness author, life coach and certified personal trainer who trades his time between Hawaii and Victoria, BC.